The discovery of oil in both Tanzania and Uganda promises economic growth in the East African region. ESBC Limited has noticed the opportunity created by this discovery and the macro-economic benefit afforded to businesses in the region. With this environment there has been a high demand for office space, a need that ESBC can meet efficiently. ESBC’s Kilwa House in Dar es Salaam, Tanzania is already one of the preffered locations for businesses which prefer to locate their offices out of the city center. In Uganda, ESBC Limited owns office space in Rwenzori Towers, located outside the Kampala CBD, away from the traffic congestion in the city. According to the Managing Director, Ms. Maria Wamakonjio, ESBC is investing Shs84 million (US$1 million) as part of their elaborate strategy to expand their business in Tanzania and Uganda. The company is targetting business start-ups and multi-nationals venturing new business into Uganda and Tanzania. ESBC was set up in 2006 and so far has helped over 200 companies to successfully launch and build their businesses in Kenya. The company administers office space, allowing their clients time to focus on the core business. 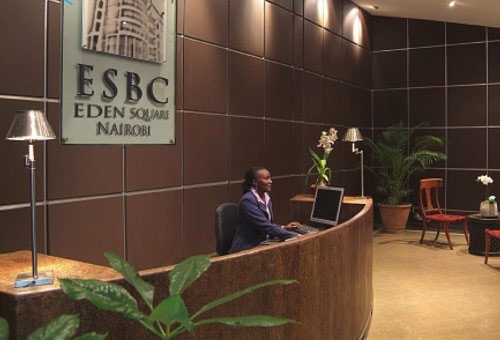 ESBC has 5 centers in Kenya, with 1 in Kisumu and 4 in Nairobi. Plans are underway to expand into Rwanda, as ESBC establishes itself to be one of the largest serviced office providers in the region.